Together we will continue to explore the REAL Coaching Model. 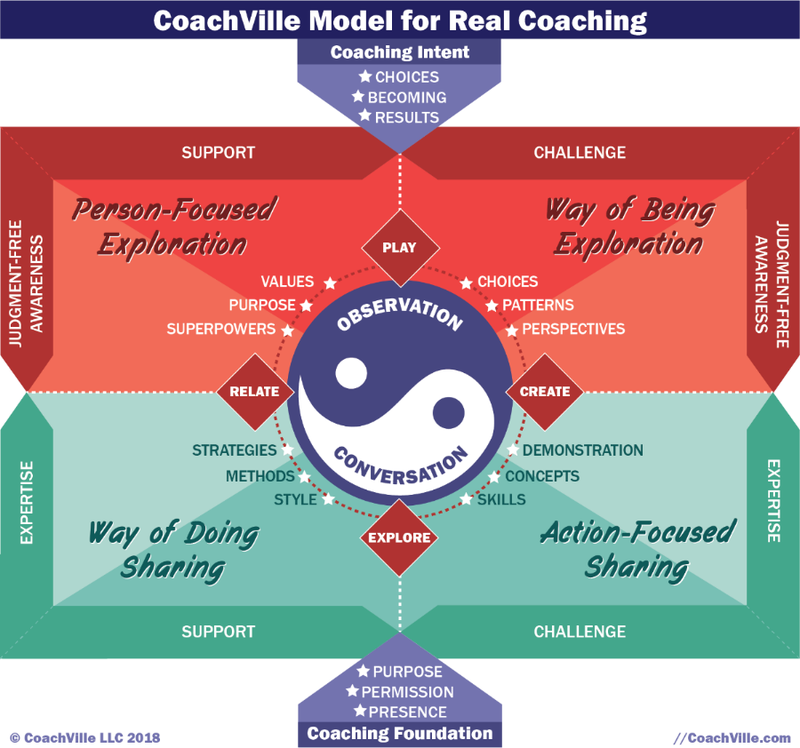 This model will help you become a GREAT Coach for the purposeful players, performers, creators and change-makers of the Connected Age. You can read the article in PDF format here. <<< For real! You want to read this one. This is a big idea for us coaches. Since we all grew up in the Industrial Age, our minds were programmed to turn everything into work. And most coaching models from that era are not really coaching models at all. They are more like counseling with a project management twist: Talk about some life problem and then make a task list and create accountability. You can only coach someone who is playing, because the purpose of coaching is to guide the player in pursuit of playing better. So this new model puts PLAYing life at the center. Play is when you do something that you can’t control but you can influence through strategy, skill, energy and mindset. This means you can get better results over time. Three key experiences of play are: exploring, relating and creating. This is how life is played. So for example a coaching conversation is not focused on what task the client will complete, but rather what new territory will the player explore next? What new experiments can be tried in how the player is relating and creating? And then… how can the coach and player co-create a way for the coach to observe the player at play and find ways to play better and better. Most people who get into the field of coaching are very supportive by nature. As a result, most coaching today is heavy and support and light on challenge. This will rarely lead to great coaching. Sometimes you need to listen and understand and champion the player. Sometimes you need to point out a blind spot or a poor choice or challenge them to step out of their Comfort Zone into the Transformation Zone. A great coach is able to read the player in their situation and know when to support and when to challenge. There is a huge gap in the professional coaching world on this spectrum. The ICF oriented school models are all Judgment-Free Awareness (or coaching presence) and NO expertise. While the “Guru Schools” are all expertise and no Judgment-Free Awareness. Neither of these in the current extremes will lead to great coaching. The great coach reads the player and their situation and provides what they need in the moment! I highly recommend reading the whole article here for all the details.